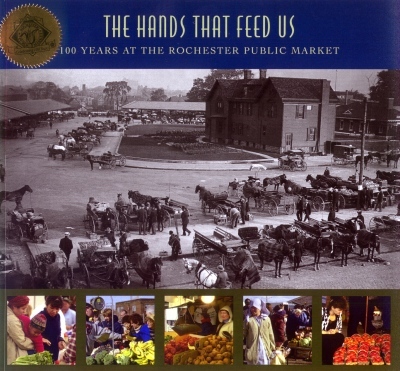 The year 2005 marks the 100-year anniversary of the Rochester Public Market and nothing could be a more fitting celebration of this accomplishment than this lovingly researched book and photo essay, The Hands That Feed Us: 100 Years at the Rochester Public Market. Using more than 175 photographs, vintage images, drawing, and newspaper clippings, videographer Nancy Rosin and designer Karen Burns chronicle the Market’s evolution from a strictly wholesale enterprise into today’s newly renovated farmer’s market. Rosin has spent much of the past decade producing both a film documentary about the market and along with Burns, a 2001 calendar of historic Market images, so when the city wanted to commemorate the market’s centennial, the creative team became the logical choice — with great results. Part social history, part photo documentary, this concise paperback explores everything from the original construction of the site to the tensions between farmers and hucksters to the impact of the automobile and rise of the supermarket. That the Rochester Public Market has endured the tremendous transformations of the 20th century is an amazing feat, concludes Rosin. It stands as one of only a handful of public markets that have been in continuous operation for a century. “The Market is a link between the city’s past and present — not a theme park or museum but a living, working institution,” Rosin explains. It remains a low-tech, gathering place for commerce, where business in conduced face to face.